Marine veteran and Democratic Rep. Seth Moulton recounts his experiences in Iraq and on Capitol Hill, and calls for a program of national service to bring Americans together again. Seth Moulton grew up in Massachusetts and graduated from Harvard, but he didn’t follow his classmates to Wall Street; he joined the U.S. Marine Corps, a choice that shocked his liberal friends and family. Like most Marines, Moulton signed up to prove something to himself. But discussions with his mentor, the Rev. Peter Gomes, about the importance of service to country and community also influenced his decision. A few months later, the 9/11 attacks dramatically changed the course of his life. He led an infantry platoon into Baghdad during the 2003 invasion of Iraq. In 2004, he experienced the fiercest fighting of the war to date: the block-by-block battle to dislodge the Mahdi Army from Najaf. He served four tours in Iraq, ultimately working for Gen. David Petraeus to develop counterinsurgency strategies and negotiate agreements with Shia tribes. Called to Serve is the story of how the training, success, and failure Moulton endured in the Marine Corps transformed him as a leader, and how his fellow Marines changed his life. This same call drove him to run for Congress, where he works to foster bipartisan leadership and develop a serious long-term strategy for the Middle East. This deeply felt and inspirational book is a testament to the enduring strength and value of the ideals that unite us as a people. 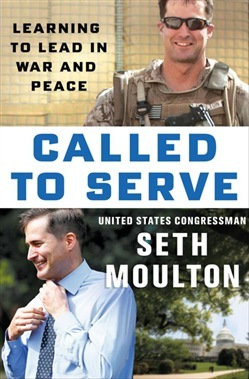 Acquista Called to Serve in Epub: dopo aver letto l’ebook Called to Serve di Seth Moulton ti invitiamo a lasciarci una Recensione qui sotto: sarà utile agli utenti che non abbiano ancora letto questo libro e che vogliano avere delle opinioni altrui. L’opinione su di un libro è molto soggettiva e per questo leggere eventuali recensioni negative non ci dovrà frenare dall’acquisto, anzi dovrà spingerci ad acquistare il libro in fretta per poter dire la nostra ed eventualmente smentire quanto commentato da altri, contribuendo ad arricchire più possibile i commenti e dare sempre più spunti di confronto al pubblico online.